In a recent paper Beltramino (2013) presented a ‘historical’ distribution of Megalobulimus sanctipauli (Ihering & PIlsbry, 1900). 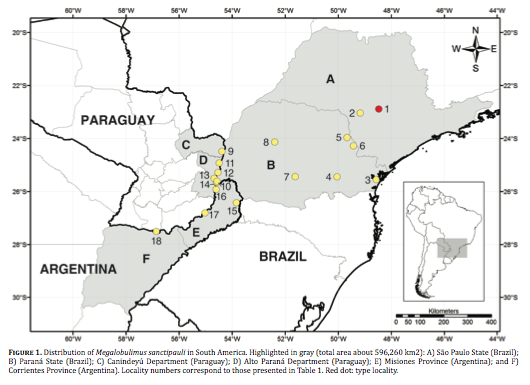 These data show that the species is distributed across southern Brazil, Paraguay and northern Argentina. The overview, listing all the known localities, is based on data from literature and online databases, the specimens not having been checked by the author. Beltramino, A.A., 2013. Distribution of Megalobulimus sanctipauli (Ihering and Pilsbry, 1900) (Gastropoda: Magelobulimidae) in South America. – CheckList 9 (2): 469-471. Available at http://www.checklist.org.br/getpdf?NGD166-12. This entry was posted in Uncategorized and tagged argentina, brazil, literature, megalobulimus, paraguay on September 30, 2013 by bramb.